The Action Pad is a third-party controller for the Sega Mega Drive, created by Naki. It is a simple six button controller with turbo features. At the top of the controller there are two buttons, but one of them is sham. This is legacy from the Sega Saturn controller, inside the controller's body button is simply filled with glue. 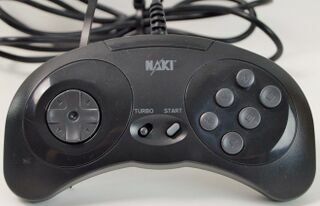 The Action Pad shares a similar shell with several Naki products, such as the Sega Saturn Wireless Pro Controller.